After thirty years of tumult and turmoil, the venerated old man was finally dying. The year was 458 A.D. The old man lay motionless on the sickbed that he knew would also be his deathbed. During the last few days of his life, he would have a chance to review his struggles as the Patriarch of Jerusalem – as a dedicated Church leader who had done his best to serve God and his fellow Christians during the tumultuous Fifth Century. For the Great St. Juvenal, who had been born around 380 A.D. and who was the close friend and colleague of some of the most renowned monks and ascetics of the early Church – including Euthymius, Theodosius, Gerasimus and Simeon the Stylite – the only thing that mattered now was the immense gratitude he felt to Almighty God. He was grateful for many things, of course – but one thing stood out beyond all the rest. During three decades of continuing struggle since Juvenal had become Patriarch in the Year of Our Lord 420, the heretics had not managed to erode the purity of the Orthodox faith! They had tried, however. And more than once, they had nearly succeeded. How dangerous their false creeds had been to the authentic faith taught by the Holy Redeemer! While some of these false teachers had insisted that Christ Jesus was a mere mortal, nothing more than a wise and kindly prophet, others had contended that the Savior of mankind was simply part of God, and not human at all. Tragically, these heresies had failed to honor the most important part of the entire creed – the idea, championed by St. Juvenal throughout much of his life, that Jesus was actually “consubstantial” . . . that his nature was both human and godly, at one and the same time. Lying on his deathbed, St. Juvenal breathed a silent prayer of thanks. From as far back as he could remember, he had been struggling against the heretics. 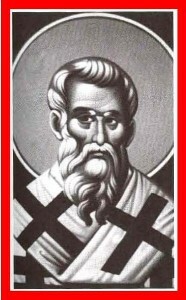 A bold and daring figure, he had fought his way through two of the most important Ecumenical Councils in the history of the Early Church: The Third Council, which had been held at Ephesus (now part of modern Turkey) in 431, and the Fourth Council, held at Chalcedon exactly twenty years later, also in a part of Asia Minor that is today a region of Turkey. At Ephesus, where the Council was presided over by the Great St. Cyril of Alexander, the blunt-spoken Juvenal had been forced to combat the blasphemous heresy of the dangerous Nestorius – who had insisted that Christ was merely the mortal son of the Blessed Mary. Two decades later, at Chalcedon in 451, he had been required to grapple with the misguided dogma propounded by those two arch-betrayers, Eutyches and Dioscorus. Both were reprehensible zealots who loudly proclaimed that Christ had been divine, while lacking a human nature entirely. At both of those assemblages, the stouthearted Juvenal and his allies had managed to prevail, and the Patriarch had been able to return to his post in Jerusalem with prayers of gratitude and a great deal of relief. But unfortunately, the heretics had not been dissuaded, and had continued to conspire against the Orthodox creed. At one point, Patriarch had even been driven from the Holy City, after the discredited Dioscorus managed to persuade the all-powerful churchman Theodosius of the rightness of his own views. Theodosius had then responded by making himself the Jerusalem patriarch! Supported for a time by the Empress Eudocia, the widow of the dearly departed Emperor Theodosius the Younger, the usurper had managed to hold the Patriarch’s throne, at least for a brief period of about 20 months. But at last, thank God, the Empress had gone to see the great monk and ascetic Simeon the Stylite, who had convinced her that the imposter must be unmasked and his heresy cut out at the root. Fully persuaded by the great monk, the Empress then rose in righteous wrath against the false Patriarch Theodosius and ordered that St. Juvenal be restored to his clerical authority in Jerusalem. This desperate struggle unfolded during the reign of Marcian and then Pulcheria in Constantinople – and when it was finally over, the Holy Church had miraculously been saved from the dangers of doctrinal pollution. There is no greater danger for Christ’s Church on Earth than heresy and as the revered Juvenal lay dying on his sickbed at the end of his 38 years as Patriarch of Jerusalem, he smiled with joy at the way God Almighty had chosen in His Wise Providence to keep the precious dogmas and doctrines purely Orthodox. During the nearly two years in which the Apostate Theodosius ruled in the Holy City, the Christian believers of Jerusalem had become dangerously confused. Indeed, this is always the great threat to the Holy Gospel of the Son of God from its attackers – that it might be diluted and diminished by the false prophets of heresy. Thanks to the endless patience and determination of St. Juvenal, however, this did not occur. The life of the Patriarch St. Juvenal rings with the authority of a Church Father who never stopped struggling to protect the spiritual life of his flock. In this way, the Patriarch’s own history mirrored the history of his beloved Holy Church – as the saga of a continuing battle to keep pure and undefiled the Holy World of Almighty God! The truth of things hath revealed thee to thy flock as a rule of faith, an icon of meekness, and a teacher of temperance; for this cause, thou hast achieved the heights by humility, riches by poverty. O Father and Hierarch Juvenaly, intercede with Christ God that our souls be saved. O divine thunder, spiritual trumpet, cultivator of faith and destroyer of heresies, in whom the Trinity is well pleased, O great hierarch Juvenaly, as thou ever standest before God, with the Angels, pray unceasingly for us all.